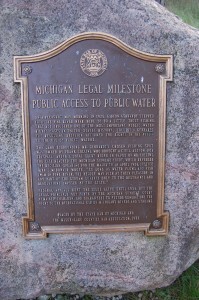 Many historic and precedent-setting legal cases have taken place in Michigan. A program sponsored by the State Bar of Michigan has been providing information on a few of these cases since the late 1980s. 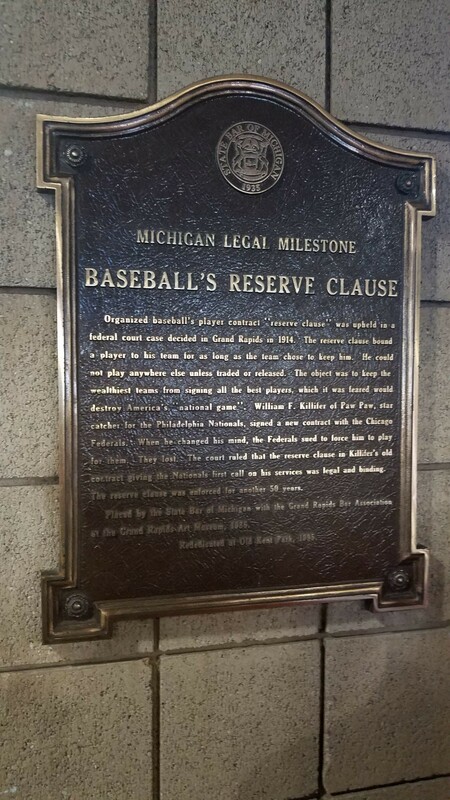 Michigan Legal Milestones plaques have been placed at 40 locations from 1986 to 2016. 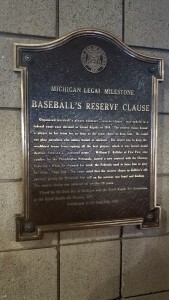 We’ve come across a few of these plaques during our travels, and today we will share a list of where to find all 40 as well as what cases they cover. Some feature notable people, others feature landmark labor cases, and others deal with topics like sports and land rights. 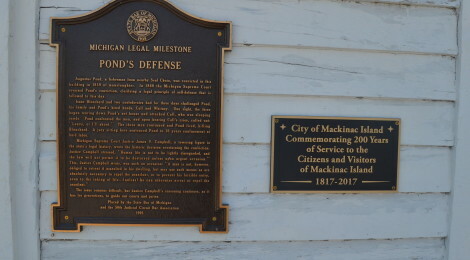 Keep an eye out for these Michigan Legal Milestones plaques – many are located at courthouses or civic buildings throughout the state. 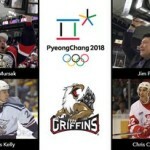 For more information on the program, head to https://www.michbar.org/programs/milestones. 1. Ossian Sweet Trial (Frank Murphy Hall of Justice, Detroit) – In 1925 famed lawyer Clarence Darrow came to Detroit to defend Dr. Sweet, who was on trial for killing a member of a mob that had shot at his home. Judge Frank Murphy ruled that Sweet had the right to defend his home in fear of his life, and that that right extended to people of all races. 2. Baseball’s Reserve Clause (Fifth Third Ballpark, Comstock Park) – In 1914 William F. Killifer of Paw Paw was a baseball player for the Philadelphia Nationals seeking to get out of his reserve clause. The reserve clause was in place to help keep talent even across the league, binding a player to their team for as long as the team chose. The court sided with the team, and the reserve clause stayed in place until 1975 and the advent of free agency. 3. 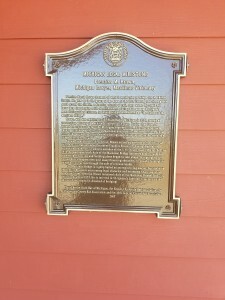 Cooley Law Office (WABJ-AM Radio, Adrian) – This marker details Cooley’s law career, which included service on the Michigan Supreme Court and with the American Bar Association. Lansing’s Cooley Law School is named for him. 4. Roosevelt-Newett Libel Trail (Marquette County Courthouse, Marquette) – In 1913, President Theodore Roosevelt sued George A. Newett for libel after Newett’s newspaper made some claims about Roosevelt’s drinking. The arguments were made that status as a public figure opened Roosevelt up to negative coverage, but both parties eventually backed down and a small award of six cents for damages was issued. 5. Justice William Fletcher (Power Center for the Performing Arts at University of Michigan, Ann Arbor) – In 1836 Fletcher became the first chief justice of the Michigan Supreme Court after statehood. He wrote the first compilation of state statutes and served until 1842. 6. Sojourner Truth (Calhoun County Justice Center, Battle Creek) – This marker details the life of Sojourner Truth, a freed slave who worked tirelessly for civil rights. She was considered and excellent public speaker and she spent the final 27 years of her life in Battle Creek. 7. Augustus Woodward (Omni Hotel Atrium near the escalator, Detroit) – Woodward was the first chief justice of the Supreme Court of the Michigan Territory. He served in that post for 19 years and is considered to have developed a great deal of Michigan’s legal foundations. 8. Public Access to Public Water (Peterson Bridge canoe landing, Cadillac) – This landmark case determined that the public has rights to recreational use of rivers and streams, and that owners of land surrounding the water can not sue those who use them. 9. 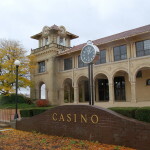 Ten Hours or No Sawdust (Morley Plaza, Saginaw) – Michigan’s largest labor strike at the time took place in 1885, as lumber workers refused to continue working past the 10 hour day that was protected by state law. This violent strike ended up with workers losing, as it would be years until real labor reform reached the area. 10. 1961-62 Constitutional Convention (Constitution Hall, Lansing) – Delegates from allover the state gathered in Lansing in 1961 to draft a new state constitution, as the old one was outdated and had been amended more than 70 times. 11. Eva Belles’ Vote (Genesee County Courthouse, Flint) – In 1888 Belles became the first woman to try to vote in an election in Michigan. She fought and eventually won the right for women to vote in certain local school elections, though it would be many years yet before women had the right to vote in every election. 12. One Person – One Vote (Oakland County Courthouse – south plaza, Pontiac) – Gus Scholle of Oakland County filed a lawsuit in 1959 after being troubled that each voting district elected one senator despite many of them having large disparities in population. This landmark case was an early start toward developing the voting districts we currently have today. 14. 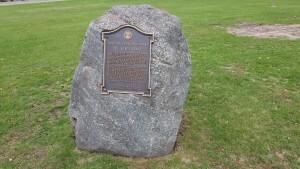 The King’s Grant (Fort Brady Park, Sault Ste. Marie) – in 1750 the King of France had granted 214,000 acres of land in Sault Ste. Marie to Louis de Repentigny and Louis de Bonne. In 1825 descendants of the men sought to claim that land, and while they won that right early on the U.S. Supreme Court denied their claim due to how much time had passed and no improvements had been made to it. 15. The Uninvited Ear (Penobscot Building, Detroit) – A landmark case in Detroit in 1971 upheld the Fourth Amendment protection from unreasonable search and seizure, extending to cover unapproved government wiretaps as well. 16. Laughing Whitefish (Michigan Iron Industry Museum, Negaunee) – This case dealt with a Chippewa chief who had received stock in a mining company. His daughter later tried to claim the shares, but the company fought back because she was the child of one of her father’s three wives and Michigan prohibited polygamy. The Michigan Supreme Court ruled that her claim was valid because polygamy was legal under tribal law and must be recognized because of that fact. 17. Protecting the Impaired (Lapeer County Courthouse, Lapeer) – This case determined that a 1913 bill passed by the state legislature ordering forced sterilization of mentally handicapped persons in state institutions was unconstitutional, as it discriminated against a specific subset of the population. 18. Rose of Aberlone (Kellogg Park, Plymouth) – This landmark case dealt with contract law, and a cow. A banker agreed to purchase a cow from a farmer for $80 with both parties assuming the cow was barren. When the farmer discovered the cow was pregnant, he refused to complete the transaction as the cow’s value had greatly increased. The court upheld his right to rescind the deal due to their mutual mistake regarding the substance of the transaction. 19. Emelia Schaub (Leelanau County Courthouse, Leland) – Emelia Schaub was the first woman elected as a prosecutor in Michigan (1936), and the first female attorney in the nation to successfully defend a murder case (1926). She has been honored with election to the Michigan Women’s Hall of Fame. 20. Mount Clemens Pottery (Macomb County Courthouse, Mt. Clemens) – This landmark labor case dealt with whether or not employees should be compensated for all time or productive time only. The employees won a Supreme Court ruling in their favor in this case, as it was ruled they should be paid for all time once punched in for the day. The Portal-to-Portal Act passed by Congress a year later relieved employers of obligation to pay for nonproductive time, unless collective bargaining was in place. 21. 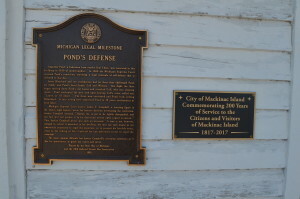 Pond’s Defense (City Hall, Mackinac Island) – I found this to be one of the most interesting cases featured, and one we had already learned about a bit while touring the Seul Choix Point Lighthouse. Augustus Pond was a fisherman living near Seul Choix, whose property and family were being harassed by three men. One night as the men started destroying his net house, he called out “Leave, or I’ll shoot” and when they continued on he fired and killed one of the men. Originally sentenced to 10 years for manslaughter, Pond later saw his conviction overturned by Michigan Supreme Court Justice James V. Campbell, who side with Pond’s right to protect himself and his property using deadly force if necessary. 22. Ending Jim Crow (Old Kent Bank Building – downtown, Grand Rapids) – Until it was challenged here by African-American dentist Emmett Bolden in 1927, racial discrimination in public places was illegal (under the 1885 Michigan Civil Rights Statute) but regularly practiced. Michigan Supreme Court Justice Nelson Sharpe overturned an earlier ruling in favor of a local theatre, thereby ending Jim Crow practices in the state. 23. 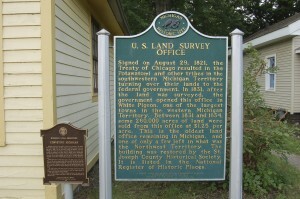 Conveying Michigan (Land Survey Office, White Pigeon) – This marker stands at the White Pigeon Land Office, which was responsible for conveying land in the 1830s. Present-day Grand Rapids, Kalamazoo, and Battle Creek were all part of the work done from this office. 24. 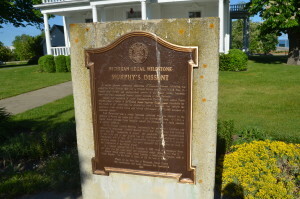 Murphy’s Dissent (Frank Murphy Home/Museum, Harbor Beach) – This marker sits in front of the Frank Murphy Museum in Harbor Beach, and celebrates Murphy’s dissent against the internment of Japanese Americans during World War II. 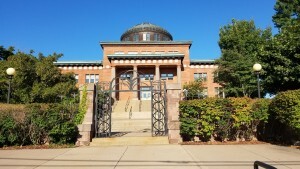 Find out more about the Murphy Museum at http://harborbeach.com/ParksRecreation/Museums.aspx. 25. Striking Racial Covenants (Museum of African American History, Detroit) – In 1944, and African-American couple (the McGhees) purchased a home on Detroit’s west side, where the neighborhood association had a covenant allowing only white residents. When they were told to move, the McGhees took their case to the Michigan Supreme Court, where they lost. They won at the United States Supreme Court, where Thurgood Marshall served as their lawyer. This ruling upheld Fourteenth Amendment protection for all regardless of race. 26. Milo Radulovich and the Fall of McCarthyism (Detroit College of Law/MSU campus, East Lansing) – As McCarthyism ran rampant in the 1950s, Milo Radulovich chose to fight being stripped of his Air Force commission for “associating with his subversive family members.” He retained two Michigan attorneys who helped sway public sentiment in his favor, and this case is generally credited as the one that struck the final blow to Senator Joseph McCarthy’s career. 27. Judge Henry Hart, Committee of One (Midland County Courthouse, Midland) – This marker honors the career of traffic court judge Henry Hart, who is credited with saving many lives by tirelessly pushing for the installation of yellow pennant “No Passing Zone” highway signs in Michigan. 28. 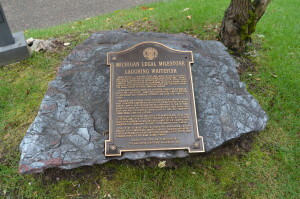 Mary Coleman: Pioneer, Advocate, Woman (McCamly Plaza Hotel, Battle Creek) – This marker honors the career of Mary Coleman, who in 1972 became the first female justice on the Michigan Supreme Court. She would later be elected as chief justice and serve two terms in that position. 29. 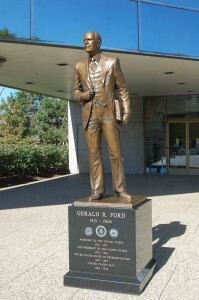 Gerald R. Ford Jr., Michigan Lawyer (Ford Museum, Grand Rapids) – This marker highlights the humble beginnings and Grand Rapids-based law career of Gerald R. Ford. In 1974, Ford became the 38th President of the United States of America after Richard Nixon’s resignation. 30. Freedom Road (Courthouse, Cassopolis) – In the early 1800s, Cass County was a haven for “free Blacks” and Quakers. In 1847 a group from Kentucky led a raid on the area to try and recapture escaped slaves. The raiders were captured and arrested, and while on trial many of the fugitives they sought escaped to Canada. Seven members of the Quaker community were sued for the value of the escaped slaves, though that case ended in a hung jury. The Fugitive Slave Act of 1850 gave more power to souther slave owners to recapture fugitives, and the issue would continue to be a hotly contested one until the Thirteenth Amendment was ratified in 1865 outlawing slavery. 32. Prentiss M. Brown: Michigan Lawyer, Mackinac Visionary (Bridge View Park, St. Ignace) – Considered the “father of the Mackinac Bridge,” Prentiss M. Brown was a Michigan attorney who realized the need for a bridge across the Straits after he was unable to make it to a Michigan Supreme Court case due to winter ice. He was the first chairman of the Mackinac Bridge Authority, and overcame many financial and legal obstacles while trying to get the bridge built. 33. Poletown and Eminent Domain (Zussman Park and City Hall, Hamtramck) – In 1980, Detroit and Hamtramck came together with General Motors to condemn a neighborhood in order to build a new plant. The Michigan Supreme Court upheld he right of eminent domain, and expanding its reach to include economic development. In 2004 the Michigan Supreme Court reversed the decision. 34. From a Whisper to a Rallying Cry (32585 Concord Drive, Clawson) – Vincent Chin was killed in a hate crime in 1982. Upset with the lenient sentences given to his assailants, the Asian American community rallied and groups like American Citizens for Justice were formed. This case helped pave the way for state and federal handling of hate crimes, including minimum sentencing guidelines. 35. Elk, Oil, Environment (Otsego County Courthouse, Gaylord) – In the 1970s a battle raged between environmentalists seeking to preserve the Pigeon River Country State Forest and its elk herd, and oil companies looking to drill in the forest. The Michigan Supreme Court handed down a 1979 ruling allowing drilling in a select part of the forest, and years later the cooperative model that has allowed the elk herd to thrive while the forest also yields valuable resources is a model of resource management success. 36. Milliken vs. Bradley: Segregation, Busing, and Boundaries (Theodore Levin U.S. 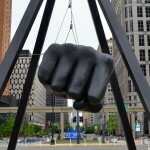 Courthouse, Detroit) – After Brown v. Board of Education led to school desegregation nationwide, the Michigan legislature passed a 1970 bill to decentralize Detroit schools. The NAACP fought against what they saw as intentional segregation of schools. The case made its way to the U.S. Supreme Court where a 5-4 ruling overturning the federal court’s integration plan was seen as a huge blow to Brown’s impact. By the late 1970’s Detroit was considered to have the “Most Segregated City” in the country. 38. Berrien County Courthouse: Michigan’s Oldest County Courthouse (Berrien Springs) – This 1839 courthouse is Michigan’s oldest county courthouse. 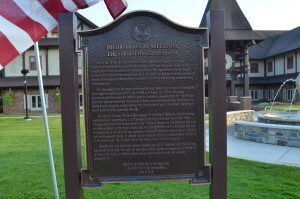 The marker highlights the importance of county courthouses as meeting places, sites of religious services, theatrical and musical performances, weddings, and more in addition to being the cornerstone of local government. 39. Great Ferris Fire (1202 South State St., Big Rapids) – Governor G. Mennen Williams signed a law in 1949 establishing what would eventually become Ferris State University as a state institution. When a fire destroyed two-thirds of the campus the next year, it forced Williams to bring bipartisan support forward to continue the planned transfer to the state and rebuild the school.